Chambray. Crop tops. Neons. Gold-dipped everything. As I’ve been simplifying my life in the past couple of years I’ve watched these trends drift by without partaking in them. I found myself on the cusp of diving in to certain trends – especially if I saw their bright displays on endcaps at Target. They seemed irresistible. The popularity of trends is based on that old line: “everyone’s doing it.” We’re peer-pressured into having certain colors in our homes and pieces in our wardrobes. Think of the windbreakers and color palette nightmares from the 90’s. Did anyone actually enjoy that? Apparently they did, because some of it is back in style these days. 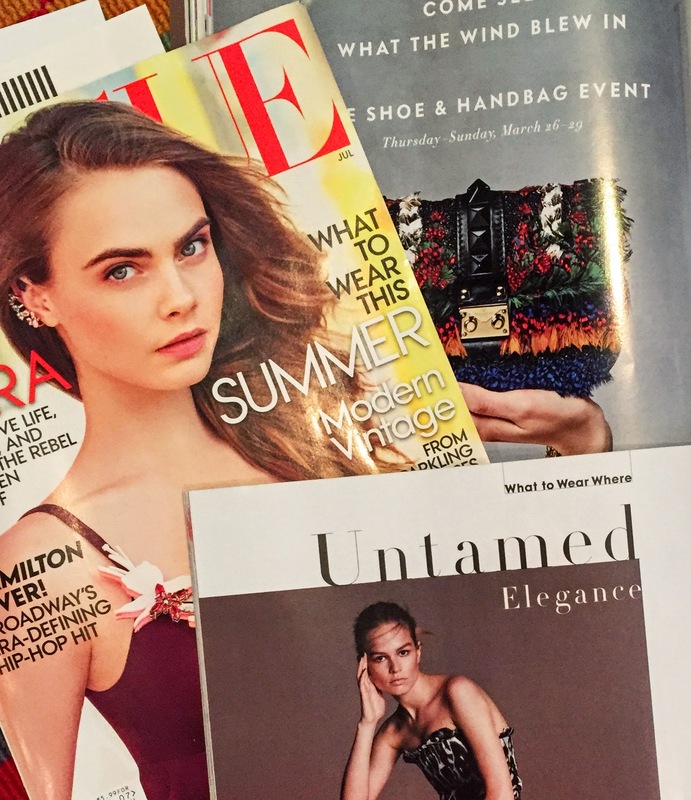 Magazines and Pinterest make them unavoidable, and soon they show up in our homes and closets. We think we’re making our homes unique, but that’s the trick of trends. You’re supposed to feel like a unique “trendsetter,” despite the fact that thousands of other people have the same piece. What’s the point of trends? Looking at them from a more removed standpoint, I’m finally seeing trends for what they are: money-makers. With all the dirt on the fashion industry (I love John Oliver’s piece on fast fashion), it’s obvious that we’ve been lied to. Trends aren’t that great after all. The best way to follow trends is to not follow them at all. I truly think that’s the best approach. Ultimately, sticking to what feels right and beautiful to you will always be in style. I know it’s no small task to keep yourself from the trends that spread like wildfire these days. But if you’re prone to impulse buys or feel pressured to follow along with current style, then try to limit your exposure to certain outlets. Sign out of Pinterest and unsubscribe to those magazines. Stay away from malls or anywhere windowshopping can tempt you. It sounds cynical, but if you’re trying to simplify, these occasions can be consumer traps. Maybe, after plenty of thought, you feel the trend might actually add value and beauty to your life. If you do find yourself drawn to a trend, there are ways to really tell if it’s right for you. See if it matches. First of all, ask yourself if it really matches with your style and personality. If you’re shy and prefer mostly dark, neutral colors, then maybe neons might be too big of a jump. If it doesn’t fit into your lifestyle, you’ll use it less. And why would you buy something just to put it in the back of your closet? Wait it out. Let the trend play out for a couple of months. Don’t jump in right after it’s spotted at fashion week. Basically, see how others are wearing or using the current trend and decide if you can see yourself following suit. If you end up taking part in the trend, then this will give you an idea of how to use it/wear it best. Ask if it’s worth it. This is where you need to be honest with yourself. Can you see this having a long-term place in your life, or will it fizzle out in a few months? Is the price worth the value you’ll get from it? Find an alternative. At this point, it’s likely that you’re on board with the trend. Instead of going to Target and purchasing it immediately, check out your alternatives. DIY and secondhand are great options, and vintage is even better (you’ll look like you liked the trend before it was cool). Plus, this prolongs the search and makes you think more about what you’re seeking and why you’re purchasing it. Personally, I’ve started to stick to basics: simple dresses, jeans and t-shirts. I also keep a floral romper and a sequin butterfly shirt (both which will never be truly in style). Why? Because I love them. Wearing and buying only things you love and that add true value or beauty to your life is the best way to keep from getting swept up in current trends. I’ve read arguments where minimalism in itself is a trend, which may be true (it’s been such a buzzword lately). Minimalism is on the rise, especially among Millennials, and it seems to be a bit scary for marketers. But honestly, who cares if simplicity falls out of style? Isn’t simple living reward enough? This entry was posted in Minimalism and tagged consumerism, fashion, lifestyle, minimalism, simplify, trends. Bookmark the permalink. Great post! I get excited about trends, but they tend to just sit in my closet. I’m not too adventurous with my style, but I convince myself I’ll wear it “someday.” Since I’ve figured out that “someday” won’t really happen, it’s helped me do a better job of just skipping trends completely! Oh the “someday” trap! A few years ago I had a closet full of someday stuff, and it feels so much better without all that. It’s so much easier to avoid buying new things if you just avoid the shops. I hadn’t been tempted in months, then I popped for a browse and all those ‘must buy’ feelings came back! Not planning on setting foot in one any time soon!! Oh my goodness, I know what you mean. Even Pinterest is a dangerous place for me to be – I start thinking about what I don’t have. It’s ridiculous, because I feel like I really do have more than enough. So yes, staying away from those temptations in the first place is absolutely essential when trying to simplify!